Today’s edition of Ciudad Guayana daily Correo del Caroni had terrible news for its readers: its daily edition will cease this Friday, July 31st and the following Friday the paper will become a weekly paper. 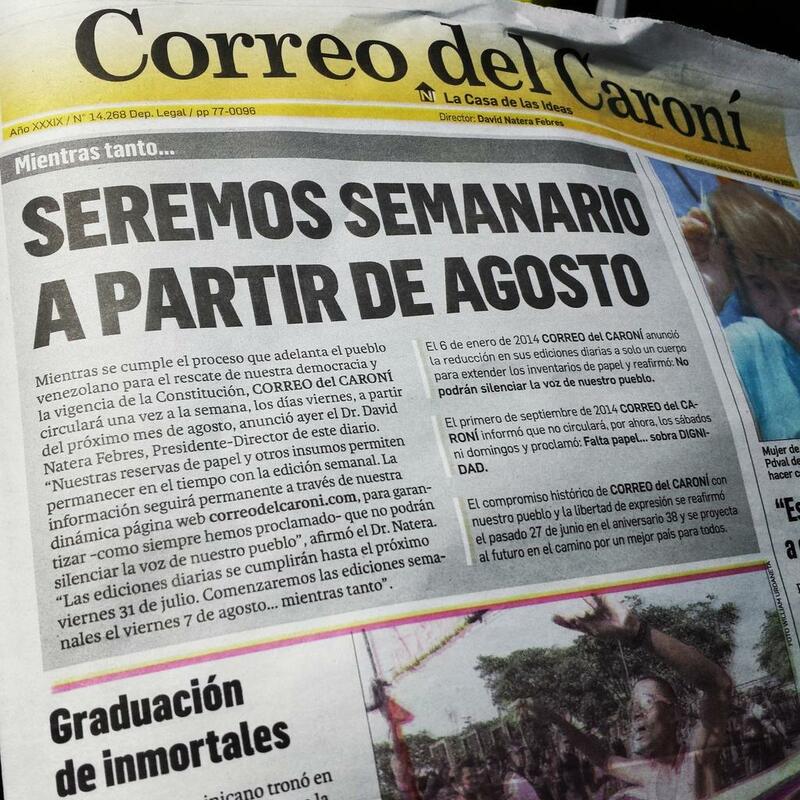 One of the few independent media outlets in the entire Guayana region, Correo del Caroni has struggled since last year thanks to the reduction of available newsprint. Last September, the paper stopped printing on Saturdays and Sundays, and months before it was forced to cut from three sections to just one. The paper decided to not negotiate with the State’s newsprint-provider CEAM to protect its editorial line, and instead is working to improve its online presence through the web site correodelcaroni.com. Correo del Caroni wants to stay as “the house of ideas” (as it calls itself), instead of being a propaganda-filled “thought artillery”. Our readers are not alone and won’t be alone. The political, social and economic crisis force us to be more creative, to multiply our faith and to intensify our efforts, translating them in better information. The hegemony is disciplined to shut down dissident voices. But when it comes to messaging? Not so much. Caracas Chronicles is 100% reader-supported. Support independent Venezuelan journalism by making a donation. Guaro journalist and CaracasChron veteran. Get it fresh in your inbox every Friday.